In this paragraph, the Church shows how moral law is related to eternal law. Genesis has shown us that God created the universe. We should think of God as being like an artist, engineer, and architect who created a world for us to live in and where we can be happy in a relationship with Him. We were given freedom so that we can be free to love! A creature that is not free cannot chose. Since love is an act of the will, choosing is the first act of love. For our protection, God has enacted a law to guide us. "Law is a rule of conduct enacted by competent authority for the sake of the common good. The moral law presupposes the rational order, established among creatures for their good and to serve their final end, by the power, wisdom, and goodness of the Creator. All law finds its first and ultimate truth in the eternal law. Law is declared and established by reason as a participation in the providence of the living God, Creator and Redeemer of all. "Such an ordinance of reason is what one calls law." Q. What are the parts of law? A. Law is (1) a rule of conduct (2) enacted by competent authority for (3) the sake of common good. Another way to talk about the "rule of conduct" is as St. Thomas Aquinas has termed it to be: "an ordinance of reason." Q. What are the parts of the moral law? A. Moral law (1) presupposes the rational order, (2) established by God. This is to say that God has established an order to things for our good. What is order; order is the right relationship of things and persons to one another. For example, in the rational order established by God, children honor their parents. Similarly, private property is to be protected and remain with its owner. These are the proper relationships of things or persons to one another. What's more, the order has been established within creation by the "power, wisdom, and goodness" of God. Q. What is the basis of all law? A. The basis, the foundation and authority, of all law is the eternal law. 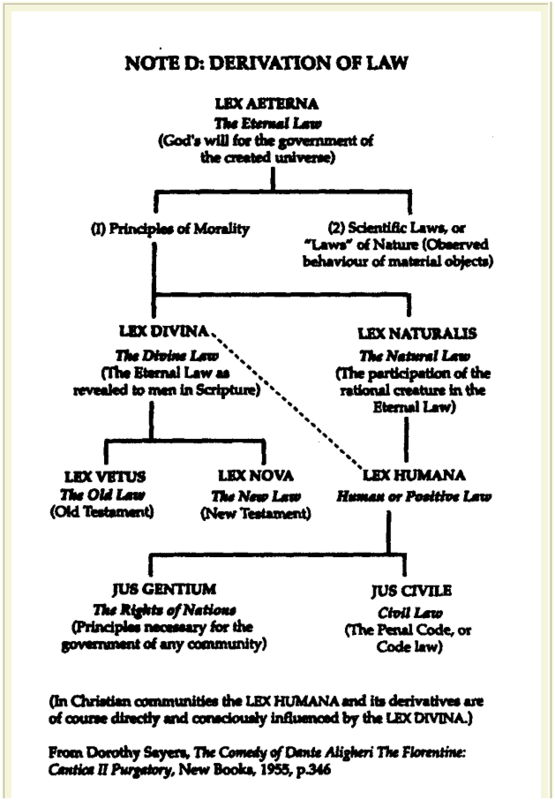 Q. what is the "eternal law." A. "Eternal law" is the plan of divine wisdom. Eternal law directs all the actions and events of the universe. It is the unchangeable effective decree of God binding the whole of creation to the fulfillment of its purpose. This means that God has established the way in which creation works and the ways within which we should live in order to be happy. Q. How does eternal law apply to creatures? A. Animals are not free to reject the eternal law in that they live according to their instincts. Only human persons are free to choose conduct that is contrary to the eternal law of God. Q. How can a "human person" be defined? A. A human person is "an animal endowed with reason, capable of understanding and discernment." Because of this freedom, a human persons must "govern his conduct by using his freedom and reason." God has entrusted the law and freedom to man. A general reading of the Holy Scriptures will show that God gradually taught the People of God how to please Him. The Jewish people were grateful that they, of all the peoples of the Earth, knew the ways and proscriptions of God. "The moral law is the work of divine Wisdom. Its biblical meaning can be defined as fatherly instruction, God's pedagogy. It prescribes for man the ways, the rules of conduct that lead to the promised beatitude; it proscribes the ways of evil which turn him away from God and his love. It is at once firm in its precepts and, in its promises, worthy of love. A. The moral law is fatherly instruction received from God according to His method of teaching in history. A. Pedagogy is the art of teaching or a method of teaching. God's pedagogy is the gradual revelation of Himself beginning with the Fall and culminating in the life and teaching of Our Lord Jesus Christ. Q. What does God's moral law positively teach? A. God's moral law "proscribes" or marks out the limits of conduct within which a person may live according to the holiness of God and thereby, with the sacrifice of the Cross having been accomplished, travel the way to the "promised beatitude." Q. What does God's moral law negatively teach? A. God's moral law also marks out the acts and conduct of a man that "turn him away from God and his love." Q. How should we regard God's moral law? A. We should see God's moral law as those of a father who cares for his children. His precepts are firm for the purpose of protecting his children and insuring that they receive the promises of beatitude. Because Our Father cares for us in this way, He and His moral law is worthy of love. The Catechism of the Catholic Church is divided into four main parts. Within the parts are sections then chapters then articles. A study of God's Salvation: Law and Grace begins with this post. I begin with Paragraph 1949 which comes before Article 1 to establish the purpose of Chapter Three. Work out your own salvation with fear and trembling; for God is at work in you, both to will and to work for his good pleasure. (Phil 2:12-13)"
A. Beatitude is happiness with God in a face-to-face relationship of communion and love. Supernatural beatitude is the perfect happiness enjoyed by a person raised by grace and the light of glory to the eternal vision of God. Q. Who is called to beatitude? A. Every person is called to "beatitude." However, every person is wounded by sin; both personal sin and original sin. Q. What are the consequences of the wounds of personal and original sin? A. Because of this wound, each man needs salvation from God. Q. Can a man overcome the wounds of sin? A. No, Man is in need of God's help. God helped man through Jesus Christ. Q. How has Jesus Christ helped humanity? A. This help comes through law that guides man and through the free gift of grace that sustains him. This help was merited by the life, suffering, and resurection of Our Lord Jesus Christ. Q. How must we, who beleive that Jesus Christ is our Redeemer, live our lives? A. St. Paul tells us that we must solemnly persevere and work toward our salvation. We learn that God is at work in us helping us toward perfection and holiness. Q. What is the meaning of the phrase, "both to will and to work for his good pleasure."